Are you the person in your group who needs two week’s notice for a weekend getaway so you can organize, pack, and rent a moving truck for your luggage? If you want more spontaneity in your life, you need to learn how to pack a bag, FAST! Whether you’re jumping in the car for a quick road trip or grabbing a flight to Vegas, we can help you become a lean, mean, packing machine with just a few simple steps. 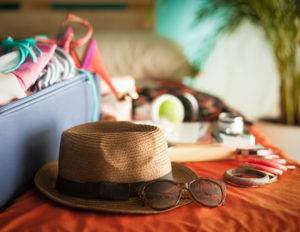 Before you reach for the suitcase or carry-on bag, make a list of everything you need and a few things you want (more on that later). Don’t let your excitement about the trip get in the way of a solid packing plan. If you run around throwing items into a duffel bag, you’ll get to Vegas with four pairs of shoes and a parka but no underwear or toothbrush. Be sure to list all the non-negotiable items like prescription medication, a comfortable pair of walking shoes, clean undies, phone charger, etc. The must-have list will be different for each person. You do you. Writers are encouraged to, “kill their darlings” meaning to cut the superfluous pieces that don’t add anything to the flow or overall tone of the story. It’s time to do that with your packing list. Gather all the clothes you’ve added to your list and look at them again with an “editing eye,” as Fashion Runway’s Tim Gunn would say. If you’ll be gone for three days, you probably don’t need five pairs of pants, three skirts, and a dress. It’s tempting to add a few, “just in case” pieces but it’s better to plan each day/night ahead of time, based on activity and environment. Savvy travelers advise sticking to a neutral palate like white, black, beige, and then amping up the attitude with jewelry and accessories. Choose clothes that can serve a dual purpose. Yoga pants as pajamas, a scarf as a light wrap, pants that can be worn multiple days with different shirts, etc. Pack small items inside shoes. Place soles of shoes in a shower cap to protect clothes. Zippered bags are your friend. You will be amazed at how much you can shove in a freezer bag. Squeeze the air out and lay flat. The next time your spouse or friends say, “pack a bag, we’re going on an adventure,” you’ll be the first one to the car. Happy Traveling!